2006 Porsche C4S Cabriolet finished in Seal Grey with Stone Grey Full Leather interior. Powered by a 325hp 6-cylinder engine and backed by a 5-speed Tiptronic S transmission. This car features equipment consisting of; AWD, Tiptronic S, Self Dimming Mirrors, Heated Front Seats, 3-Spoke Multifunction Leather Steering Wheel, Wheel Caps with Colored Crest, Sport Chrono Package Plus, Module for, Telephone PCM, Navigation for PCM, Bose High End Sound Package, Remote CD Changer (6 Disc), Supple Leather Front and Rear, Stone Grey Full Leather, Stone Grey Floor Mats, Power Seat Package, Stone Grey Top, Metal Door Sill Model Insignia, and Seal Grey Metallic Paint. The stone grey leather seats in front are firmly bolstered and deeply contoured, offering miles of comfortable driving. The Porsche 911 Carrera is considered as one of the most iconic models in the history of the industry. There aren't many sports cars that have been around as long as the 911, and none that have stayed as true to the original's formula. At the same time, Porsche has managed to transform the 911 into a modern sports car with the performance and amenities buyers expect. It's an icon of the sports car world. The Carrera 4S Cabriolet has earned a cult-like following and are highly desirable 911's, as they combine the best parts of the 911 range. Starting with the widebody that is shared with the turbo model, the Carrera 4S adds standard all-wheel drive, sport-tuned suspension, and the precision braking system from the Turbo, creating a menacing looking car that is equally happy being driven top-down on a warm summer day as it tackling the dreary winter evenings. This example also has the enthusiast required manual transmission, along with Porsche's vaunted All-Wheel Drive system, making it the perfect everyday sports car for the PNW. 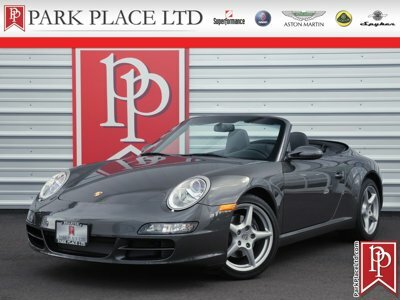 For more information on this fabulous 2006 Porsche 911 Carrera 4S Cabriolet or any of our 40+ Porsches always in stock, please contact one of our friendly and knowledgeable sales consultants or always feel free to drop by our Bellevue, WA Park Place Ltd campus - where we have over 40,000 sq ft of indoor showrooms filled with the finest cars. As part of the Park Place Motor Group family, which includes Park Place Aston Martin and Lotus of Bellevue, we always have 200+ High-Performance, Luxury, Exotic, Sports, and Special Interest Cars always in our inventory. With 200+ Always On Site, Nobody Has What We Have!